Hello my people! If you knew me in real life (and probably a lot of you who have been following for a while know this too), then you would know that I'm a huge online shopper. And, since my jobs keep me on my computer a large portion of the day, I can't help but constantly be adding things to various wishlists all over the place! So! in realizing a fun way to share a bit more of my personality and likes, etc I decided a few months ago to start doing monthly wishlists here on the blog with a few things that I've been eyeing and or would love to own if I had the money:) Here's July's! Well now what I wanna know is, what are a some things you've been wishing for lately?! or something that you'd get right away if you had the money? Do we have a few wishes in common? I'd love to hear! P.S. Just next week I'm going on my first trip alone (that's over like 200 miles) since we've been married, I'm going to the BlogHer Conference in Chicago! I'm totally estatic, and will be taking pictures like mad, so if you wanna follow along with my little adventure on Instagram, I'd be so happy to have you!! 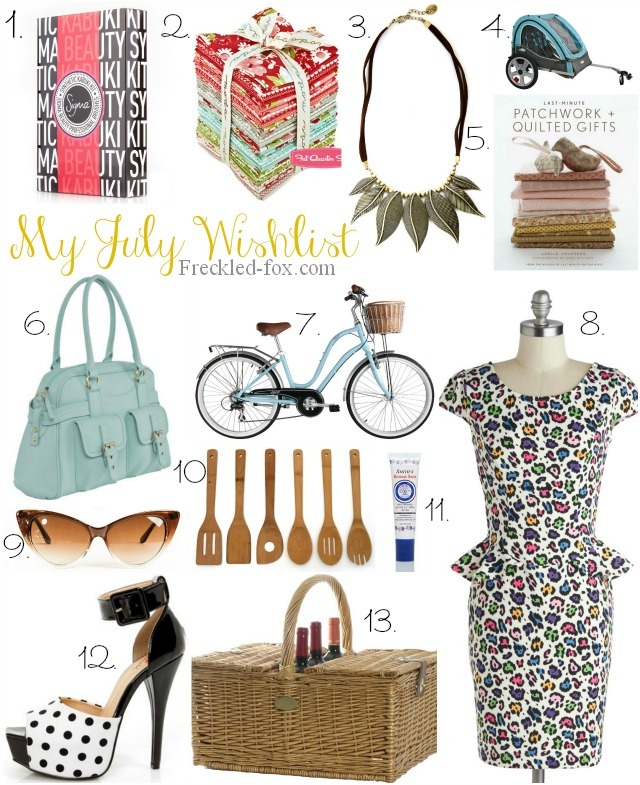 What a great wishlist! I absolutely love that dress. It is so cute! Loving all these wishlist choices! Have fun at the conference! Love your wish list! I love that bike! That necklace is adorbsI I love it! you're the best Carly. I love when you visit! and that necklace has our names on it, I just know it! Love, love, LOVE that blue bag!! And how cute is that next to the bicycle? Number 8 is so cute...I can see you wearing it too! that just made my day! haha I love how the rainbow colors are mixed with the print, I would love to be able to pull it off! THanks so much for visiting Kelsey!